Home » Costume design for The Ring Cycle by Richard Wagner. 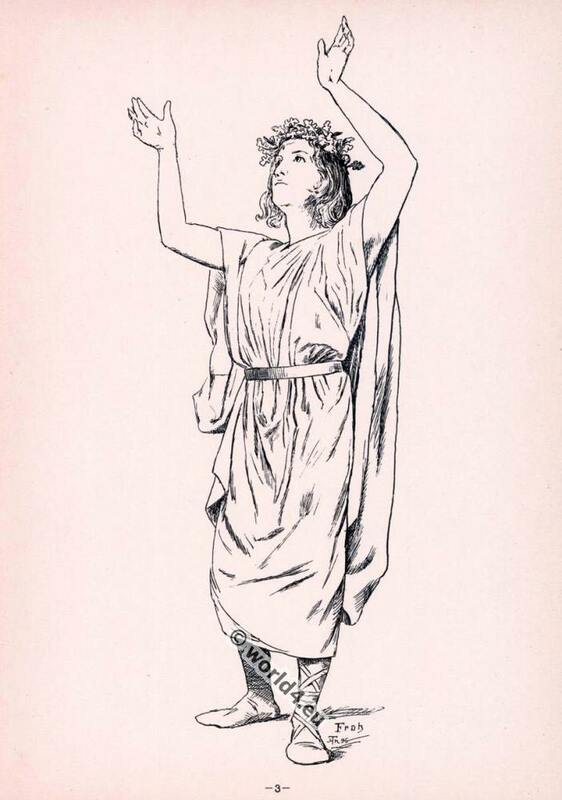 Hans Thoma costume designs for the opera The Ring Cycle by Richard Wagner 1879. Der Ring des Nibelungen (The Ring of the Nibelung, the Ring Cycle, Wagner’s Ring.) is a complex of four parts opera cycle by Richard Wagner. 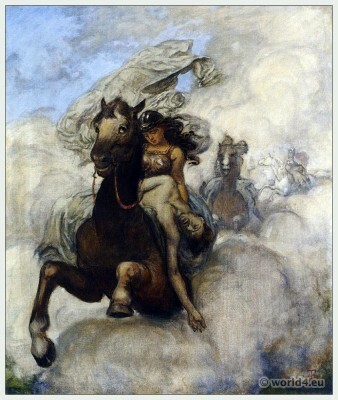 The works are based loosely on characters from the Norse sagas and the Nibelungenlied. 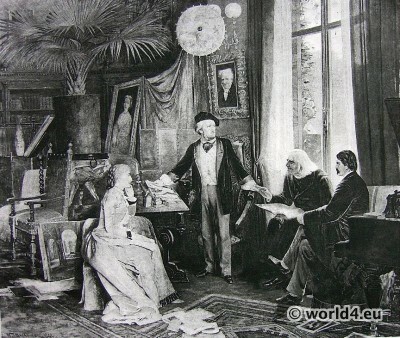 German composer Richard Wagner (1813-1883) and His Friends c. 1870. At this masterpiece Wagner has worked intermittently from 1848 to 1874. With a performance period of about 16 hours (one night before and three days), an orchestra of over 100 musicians with 34 soloists (plus men’s and women’s choir), it is one of the largest musical stage works ever. 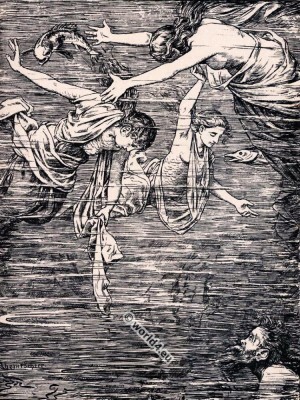 Under the direction of the composer, the entire tetralogy was (also referred to as “The Ring”) first performed in August 1876 at the Bayreuth Festspielhaus. Plate 1. The three Rhinedaughters Wellgunde, Woglinde, Flosshilde. Iridescent shed camisole, brightly colored garments. The gold of the Rhine guarding Rhine daughters. Die drei Rheintöchter Wellgunde, Woglinde, Flosshilde. Schillernde Schuppenleibchen, hellfarbige Gewänder. Das Gold des Rheins bewachende Rheintöchter. Plate 2. Fricka. White Robe, indigo blue coat. 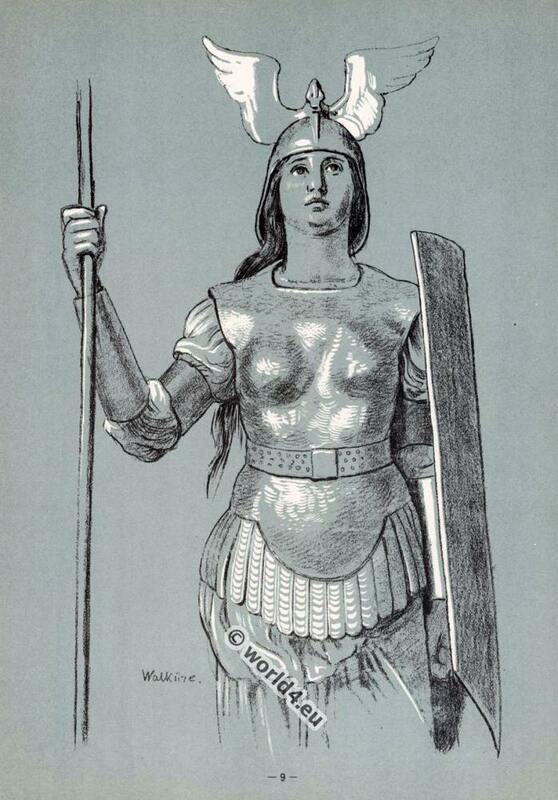 Wotan’s wife, guardian of marriage and morality; Sister of the gods Freia, thunder and joy. Fricka. Weisses Gewand, indigoblauer Mantel. Plate 3. Fro. Bright green robe. Ruler of rain and sunshine. Fro. Hellgrünes Gewand. Plate 4. Freia. Pink Robe, Rosary. 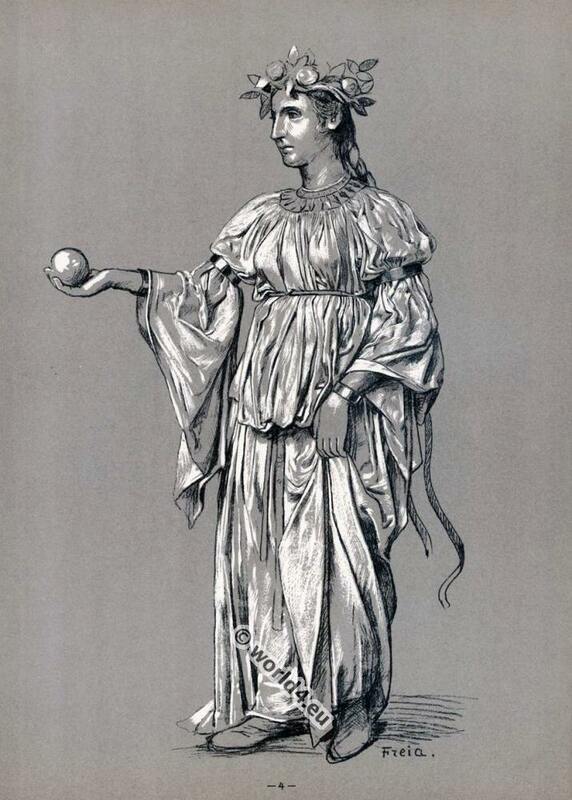 Goddess of eternal youth and guardian of the apples to the gods aging hinder it. Freia. Rosa Gewand, Rosenkranz. Plate 5. Erda. 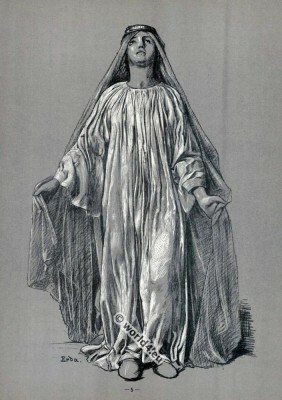 Gray robe, purple veil. 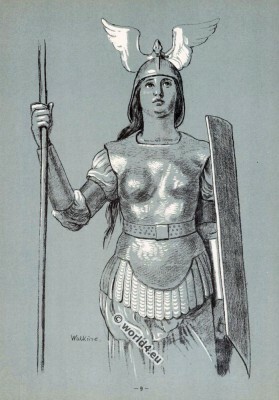 Mother of the Norns, “the world’s wisest woman” and Wala (visionary) is later impregnated by Wotan and thus the mother of the Valkyrie Brünnhilde. Erda. Graues Gewand, violetter Schleier. Plate 6. 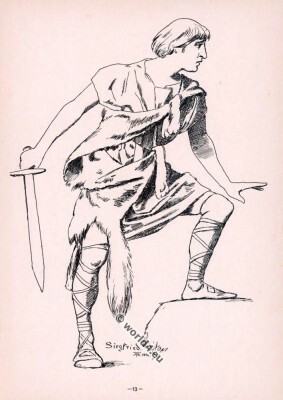 Wotan, in the “Valkyrie”. 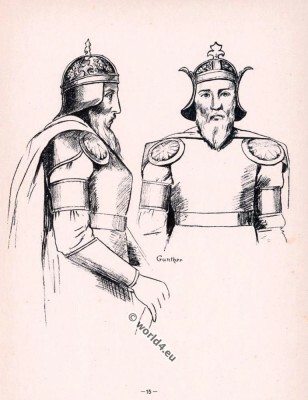 Deep blue tunic, gold bronze armor and helmet, purple coat. 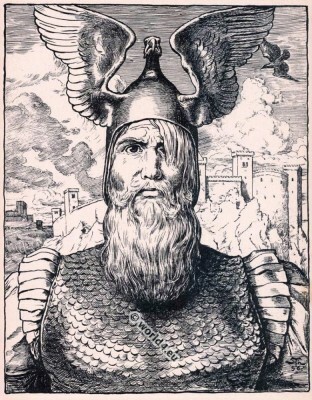 Wotan, in der “Wallküre”. 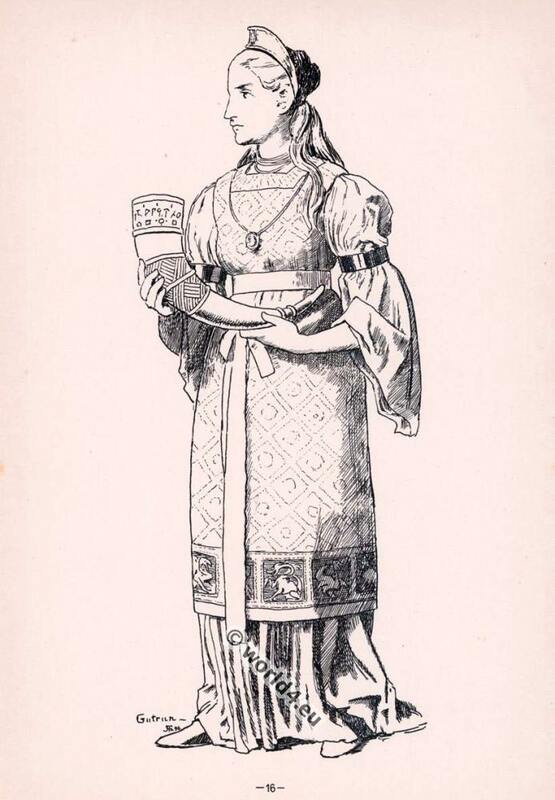 Tiefblauer Leibrock, goldbronzene Rüstung und Helm, purpurner Mantel. Plate 7. Wotan’s head. Kopf Wotans. Plate 8. Brünnhilde. White robe and hat, bright indigo blue coat. Brünnhilde. Weisses Geahnt und Hut, hell indigoblauer Mantel. Plate 9. 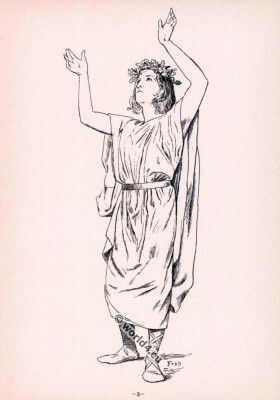 Brünnhilde. Half-figure. 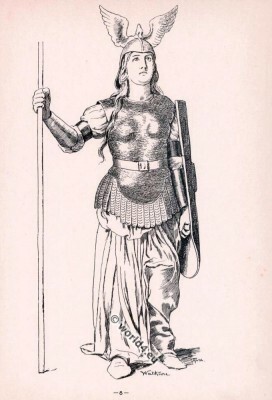 Brünnhilde. Halbe Figur. Plate 10. Brünnhilde. Breast image. 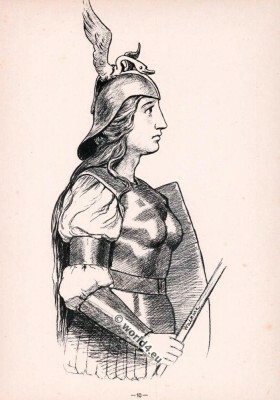 Brünnhilde. Brustbild. Plate 11. 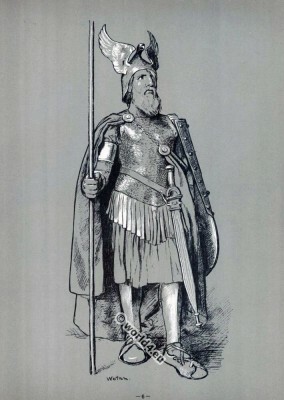 Wotan as a walker. 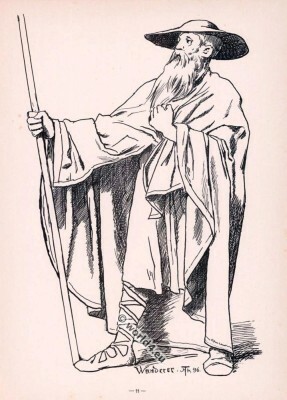 Brown Grey robe and hat, bright indigo blue coat. 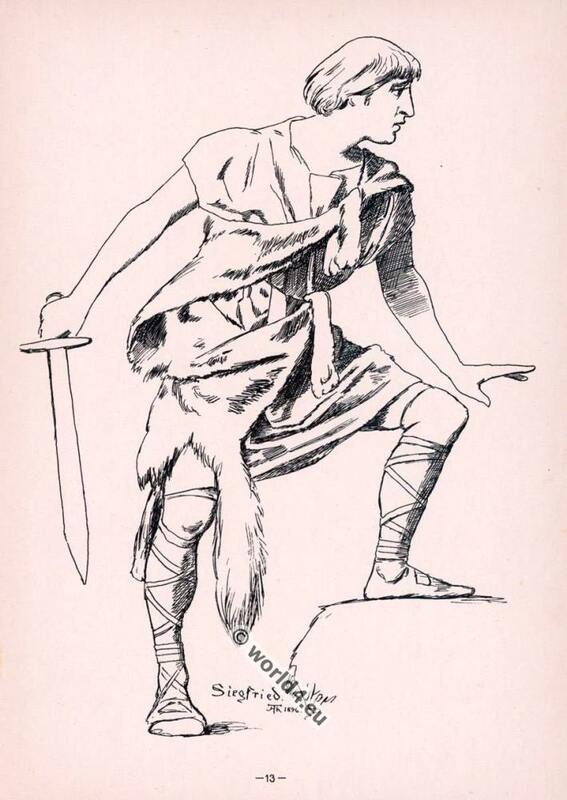 Wotan als Wanderer. Braungraues Gewand und Hut, hell indigoblauer Mantel. Plate 12. Siegfried in the forest. Brown Wolf fur. Siegfried im Walde. Braunes Wolfsfell. Plate 13. 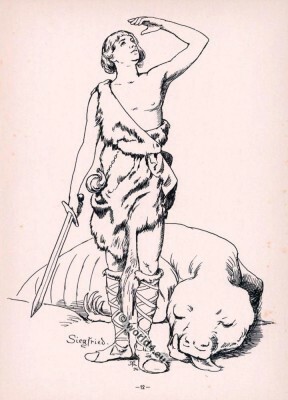 Siegfried Brühnhild perceiving. Gray shirt, brown wolf fur. 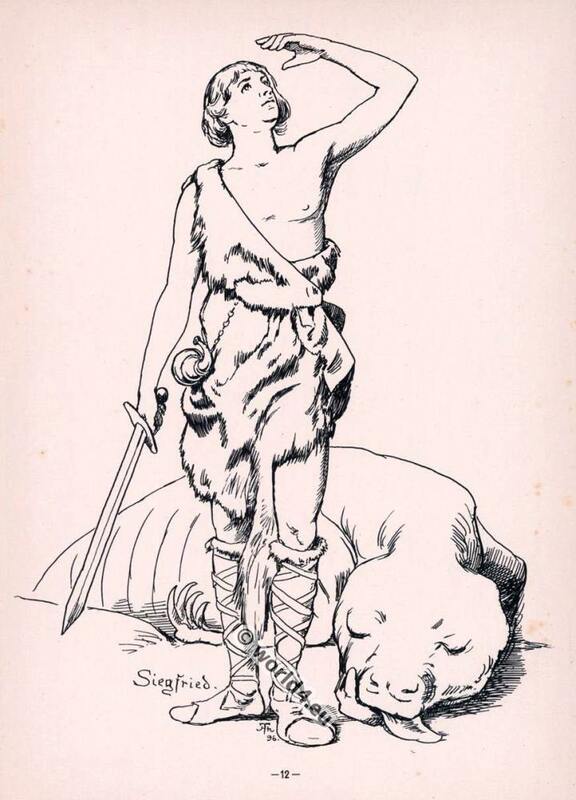 Siegfried Brühnhild gewahrend. Graues Hemd, braunes Wolfsfell. Plate 14. 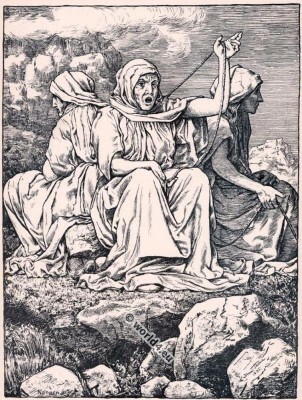 The Norns. Gray robes. Three wise women who weave in world affairs, daughters of Erda. Die drei Nornen. Graue Gewänder. Plate 15. Gunther. Light blue tunic, dark blue coat. 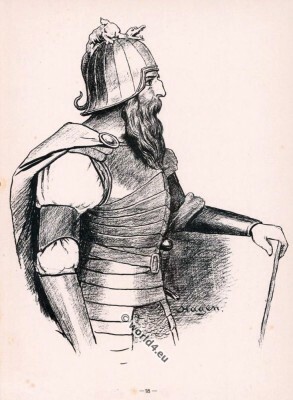 Leader of the Gibichungs at the Rhine. 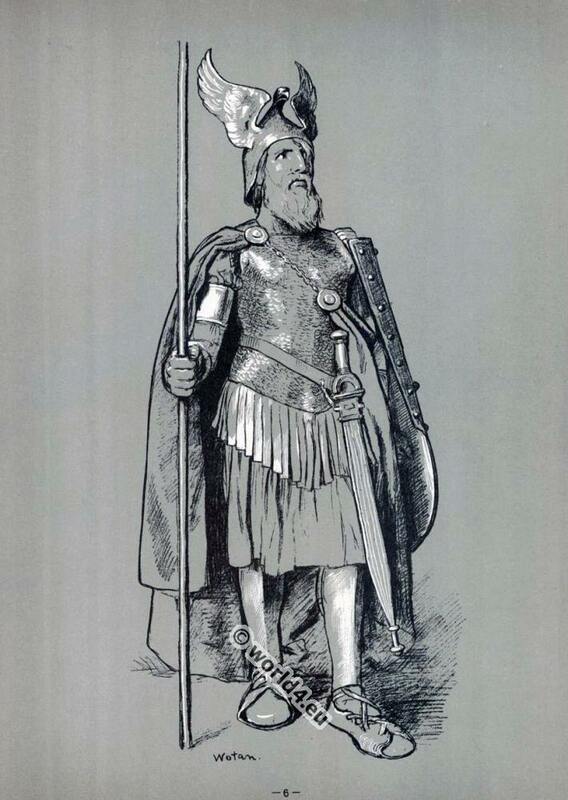 Gibica is the first mentioned by name, but not sure historically documented king of the Burgundians. He is hypothetically dated to the end of the 4th century. 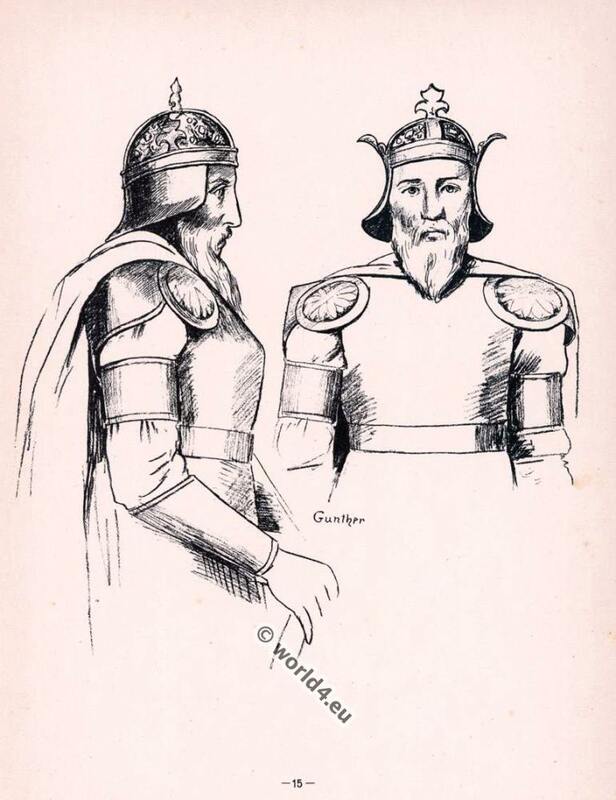 Proven Burgundy kings of the 5th century regarded as his descendants. Gunther. Hellblauer Leibrock, dunkelblauer Mantel. Plate 16. Gutrune. White tunic, gold yellow robe. Gunther’s sister, falls in love with Siegfried. Gutrune. Weisses Untergewand, goldgelbes Obergewand. Plate 17. Hagen. 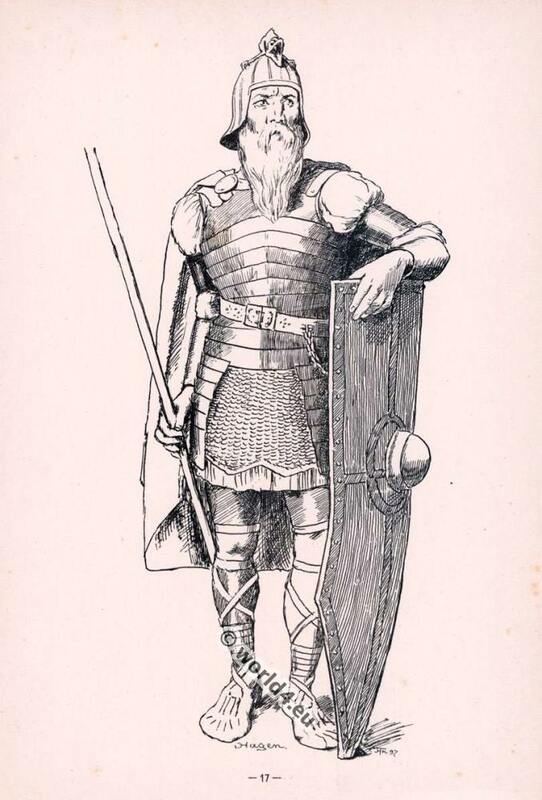 Deep brown-red tunic, rust-brown armor and helmet, dark green jacket. Pale son of Alberich and Gunther’s half-brother. Hagen. Tief braunroter Leibrock, rostbraune Rüstung und Helm, dunkelgrüner Mantel. 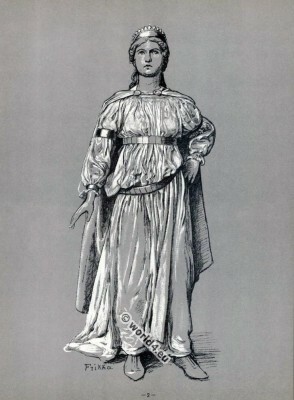 Plate 18. Hagen. Breast image. Hagen. Brustbild. 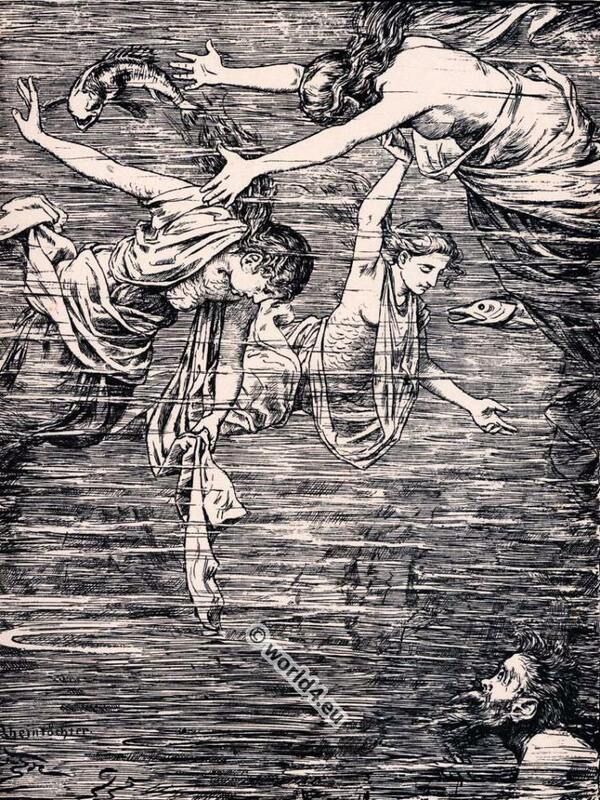 Associated to Tannhäuser by Richard Wagner. Elizabeth, the Landgravine.